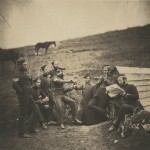 Zelt was a graduate student in the Department of American Studies at The University of Texas at Austin, focusing on the history of American photography and representation. She previously held a curatorial position at the Museum of Fine Arts, Houston and has worked at the National Archives and the Corcoran Gallery of Art. As a graduate intern, I have the opportunity to respond to a variety of research queries about the collections. 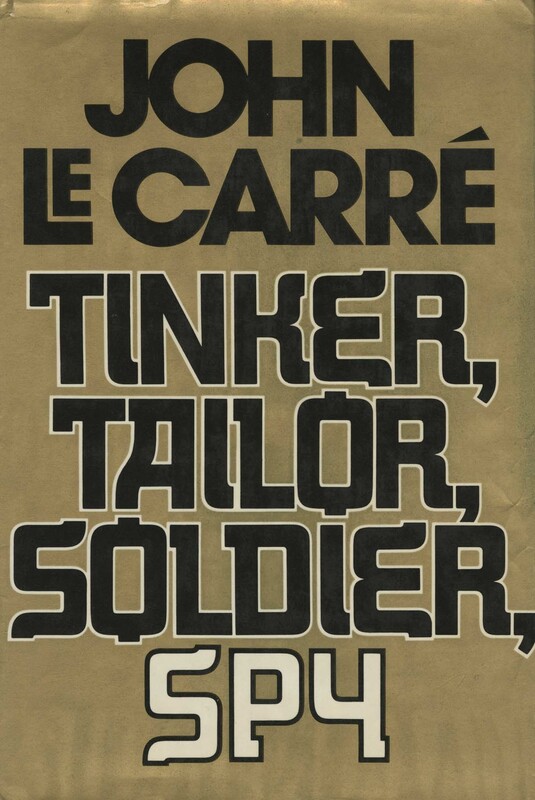 Recently, I helped solve a mystery laid by two differing editions of John le Carré’s 1974 thriller Tinker, Tailor, Soldier, Spy. Le Carré’s biographer, Adam Sisman, was trying to get to the bottom of a story he had once heard about a difference between the first edition of the novel in the United States and in England. 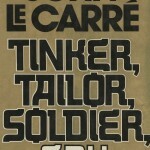 According to Sisman, just before Tinker, Tailor, Soldier, Spy was about to be published, David Cornwall (alias John le Carré) had been travelling in Laos and Cambodia with Washington Post journalist David Greenway, and Cornwall had asked Greenway to look through the segments of the novel set in Hong Kong. 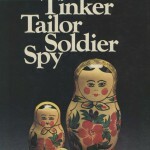 Early in the novel, Ricki Tarr describes to George Smiley his anxiety after Irina has failed to appear at a rendezvous: on a hunch he had decided to go down to the airport. “I took the Star Ferry, hired a cab, and told the driver to go like hell. It got like a panic,” Tarr tells Smiley. The airport was then in Kowloon, across the water from Hong Kong Island. As soon as they reached Bangkok, Cornwall contacted his publishers, and though the American edition had already gone to press, it was not too late to change the passage in the British edition. The Ransom Center has the first British edition and the first American edition. True to Le Carré’s enigmatic style, Sisman asked me to check the “the fourth sentence of the penultimate paragraph of Chapter 7” in both. 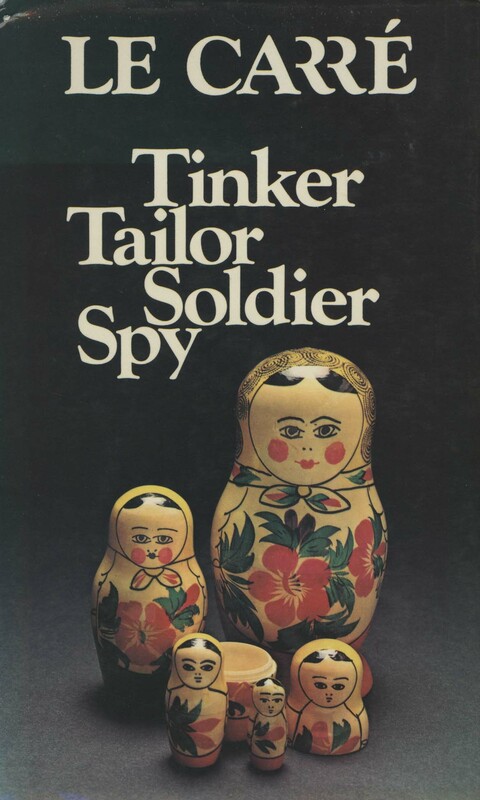 Being that it was a spy novel, I was a little nervous about what I would find, but Sisman was right. The American edition mentions the ferry; the British does not. It was a bit of an added thrill to be able to trace the movements of a spy in two different editions. Adam Sisman’s John Le Carré: The Biography will be published by HarperCollins in the United States and by Bloomsbury in the United Kingdom next fall. 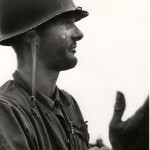 Back in November the exhibition WAR/PHOTOGRAPHY: Images of Armed Conflict and Its Aftermath opened at its fourth and final venue, the Brooklyn Museum. This exhibition, which I curated with Anne Tucker and Will Michels in my former role in the photography department at the Museum of Fine Arts, Houston, featured over 400 photographic objects dating from 1848 to 2012, including a number of photographs from the Harry Ransom Center’s collections. 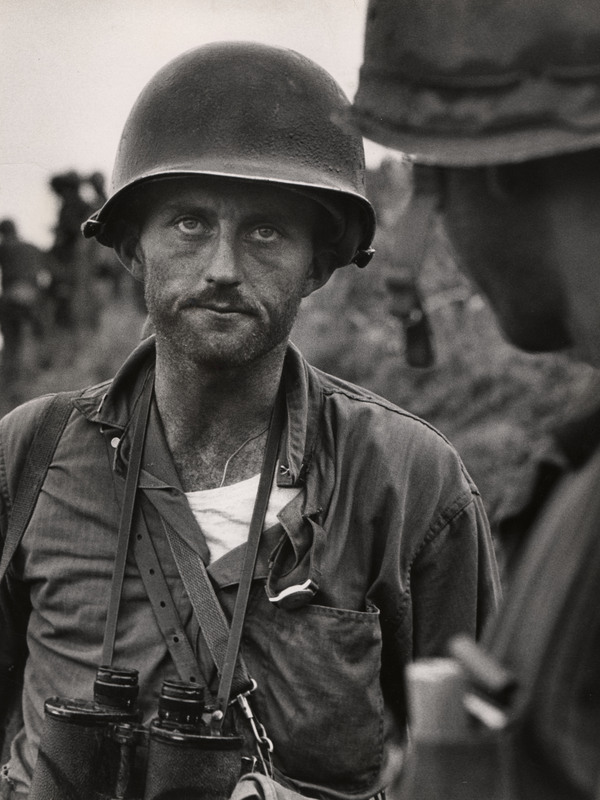 Our curatorial mission was neither to tell a history of war illustrated by photography nor to present a series on singular photographers. Instead, we hoped to bring together a selection of objects that highlighted the intersections between war and photography. 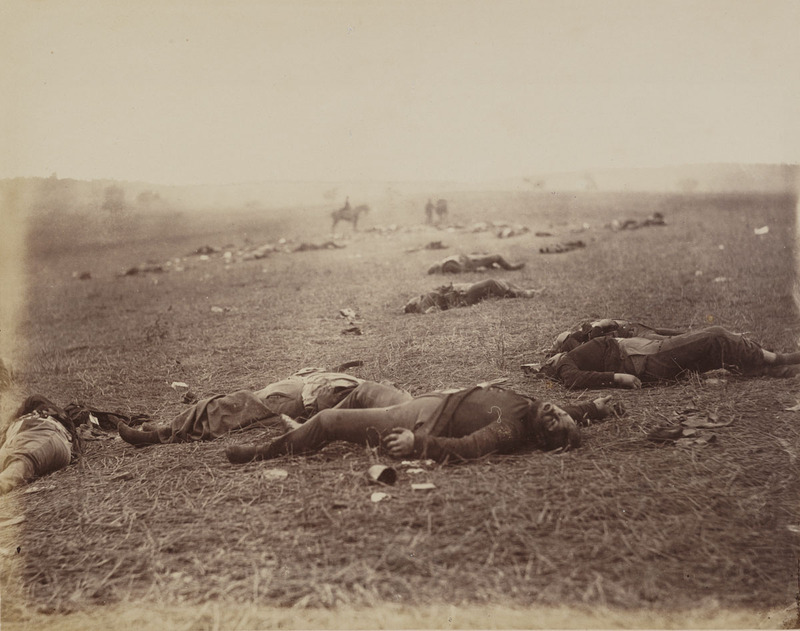 Photographs from the Ransom Center collections were included throughout the exhibition, enriching the thematic sections that explored daily routine, shell shock, and dissemination, as well as battlefield burial and death. 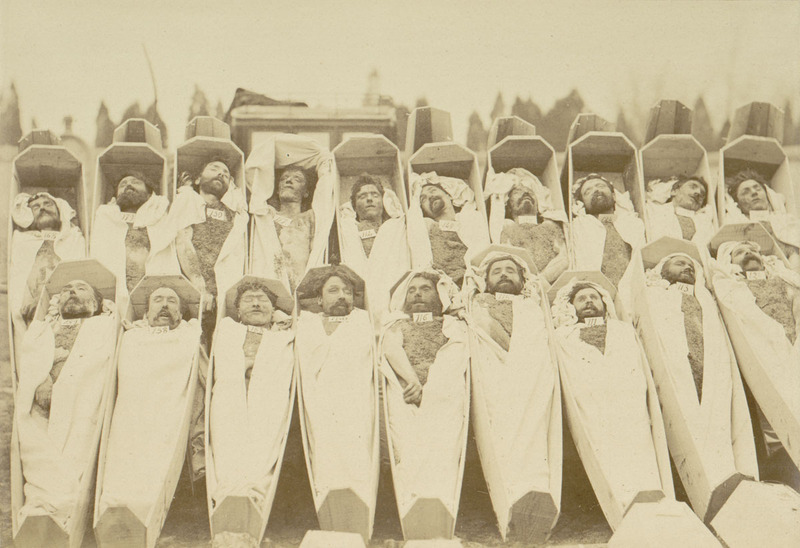 The Gernsheim collection yielded a chilling 1871 print of communards in coffins, an image likely used to discourage further unrest in the streets of Paris, as well as Roger Fenton’s iconic and controversial 1855 photograph The Valley of the Shadow of Death from the Crimean War. A Ransom Center fellowship funded by the Andrew W. Mellon Foundation Research Fellowship Endowment enabled curator Anne Tucker to spend weeks going through box after box of the Ransom Center’s prints, lantern slides, and stereographs. 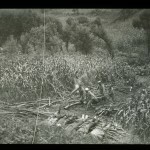 While in the reading room, she could compare the croppings of multiple photographs of Captain Ike Fenton and the U.S. Marines during the Korean War by David Douglas Duncan and share her findings. 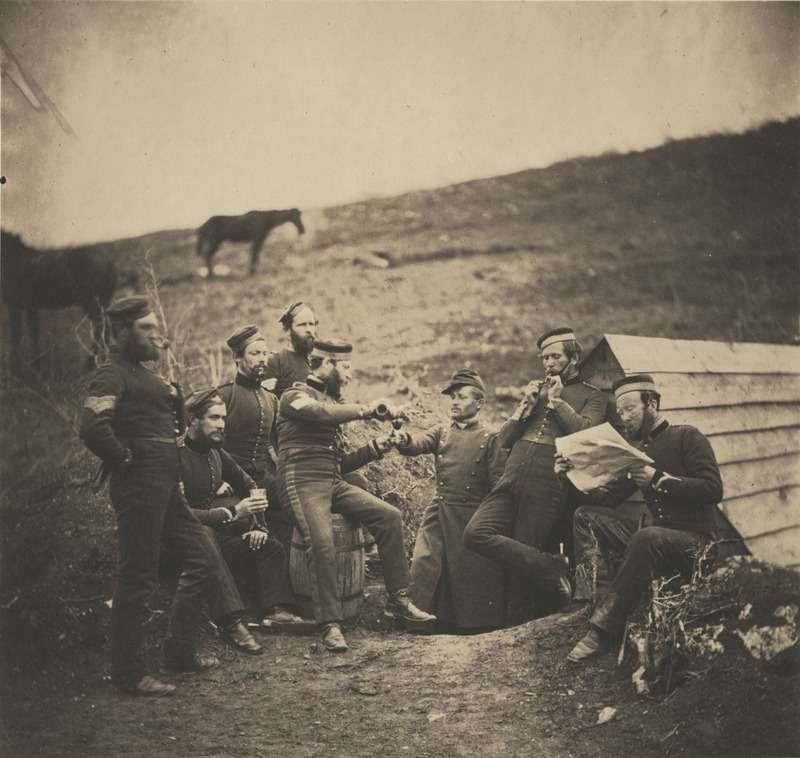 She also surveyed the collection of prints made at the height of the civil war in El Salvador by 30 international photographers, including Donna DeCesare and Harry Mattison. 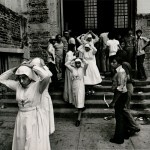 The New York Journal- American photo morgue provided one of my favorite photographs in the exhibition. 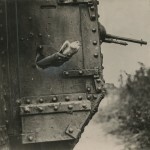 It is a small print from 1918 of a carrier pigeon being released from a tank on the Western Front. The image itself references one of the means of communication (pigeon transport) that is often associated with World War I, but it is also important as a photographic object because it carries the marks and highlights of an editor’s pencil, readying the print for reproduction and the image for dissemination. David McLellan. “Releasing Carrier Pigeon from Tank, Western Front,” August 1918. Gelatin silver print. Roger Fenton. 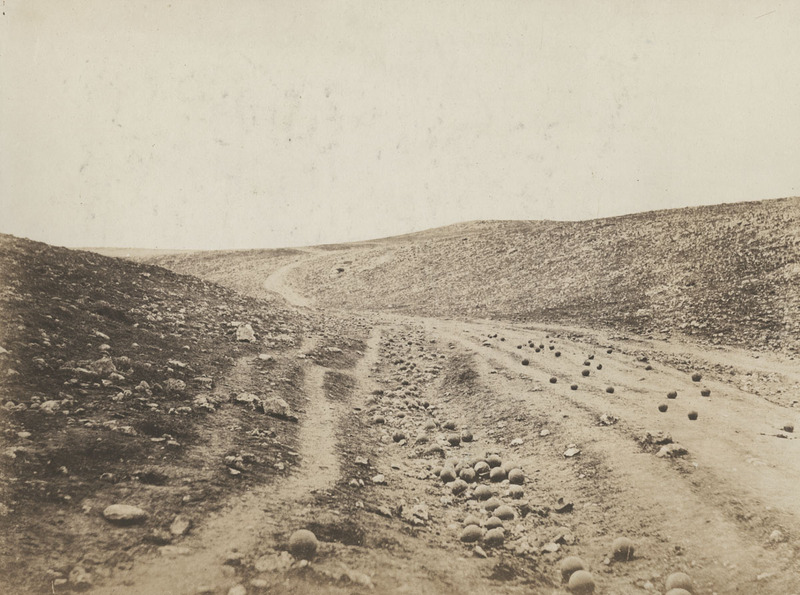 “The Valley of the Shadow of Death,” 1855. Salted paper print from a paper negative. Felice Beato. 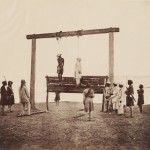 “Gallows on which two of the King of Delhi’s sons were hanged for having taken part in the murder of the English resident at Delhi at the commencement of the mutiny, India,” May 1857. 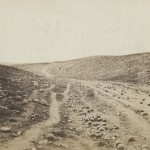 From the album “Photographic views, Crimea, India &c.” Albumen print. David Douglas Duncan. 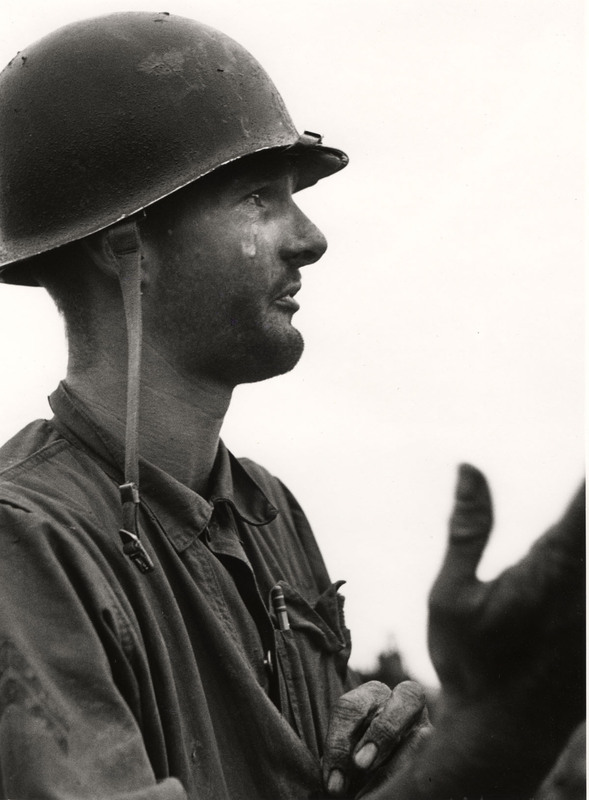 “Corporal machine-gunner Leonard Hayworth upon learning there were no more grenades, ammunition from his machine-gun reinforcements to take the place of the wounded and dead or communication from the rear, Korea,” September 1950. Gelatin silver print. David Douglas Duncan. 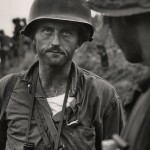 “Captain Ike Fenton, Commanding Officer of Baker Company, 1st Battalion, 5th Marine Regiment, 1st Provisional Marine Brigade, receives reports of dwindling supplies during the battle to secure No-Name Ridge along the Naktong River, Korea,” September 1950. Gelatin silver print. 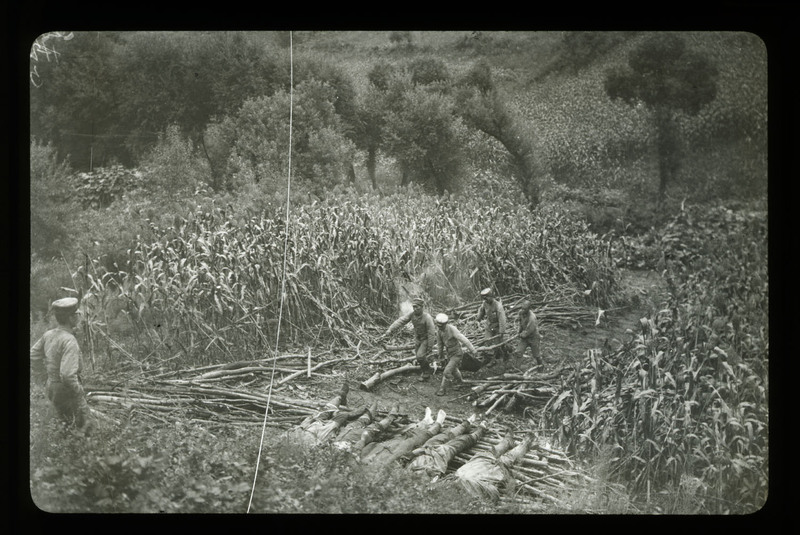 James (Jimmy) H. Hare “Men carrying wood to a pyre in the fields near Lioyang where five dead are laid out,” ca. 1904–1905. Lantern slide. James (Jimmy) H. Hare. 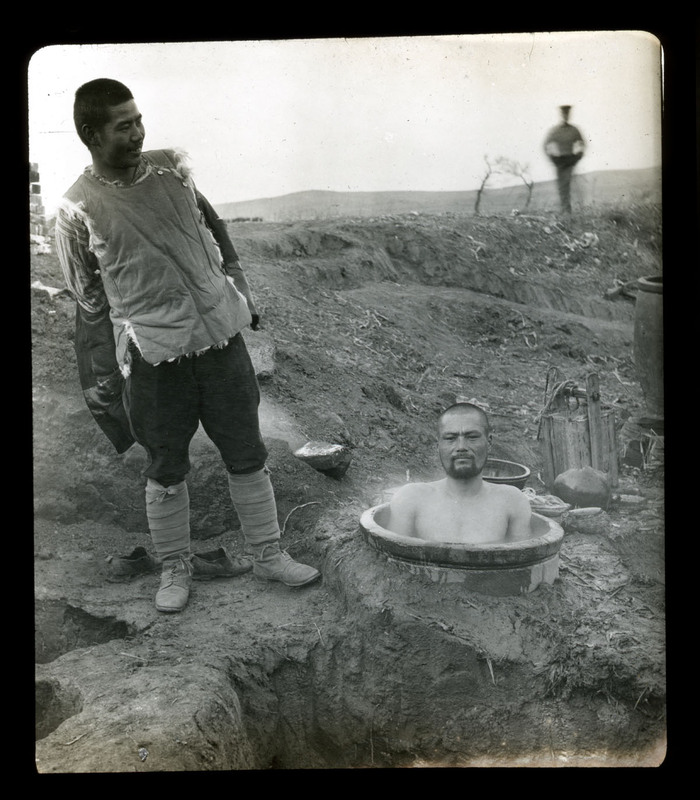 “Taking a bath at twelve below zero in December along the Sha O River,” c. 1904–1905. Gelatin silver print. Unknown photographer. 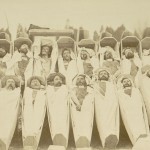 “Insurgents in Coffins, Paris,” 1871. Albumen print. Roger Fenton. “L’Entente Cordiale,” February 29, 1856. Salted paper print. Harry Mattison. 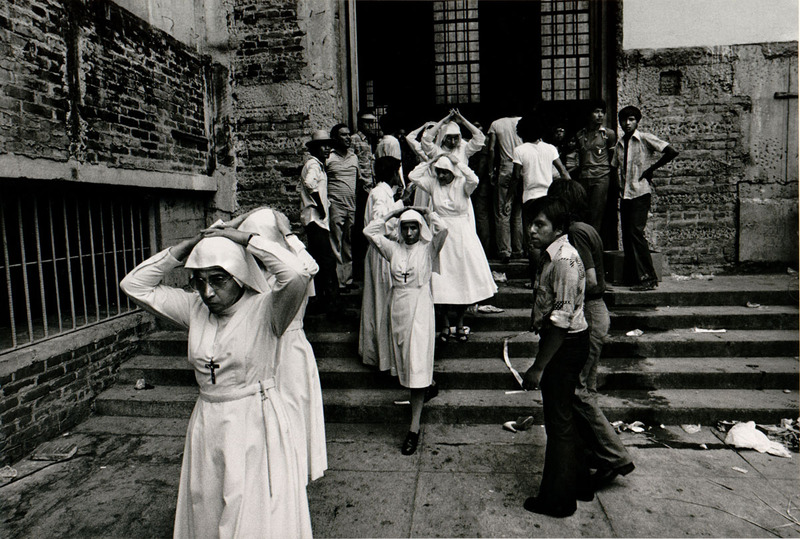 “Nuns Leaving the cathedral after the funeral of Archbishop Romero,” March 30, 1980. Gelatin silver print. Timothy O’Sullivan. 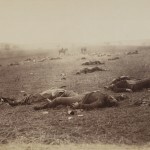 “A Harvest of Death,” July 4, 1863. Albumen silver print.